So, you want to photograph hummingbirds. Below are links to pages covering various aspects of photographing these little speedsters. 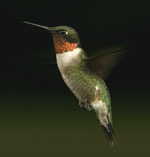 Though you can simply go to the "Quick Start Guide" if you have not tried hummingbird photography before, you will likely benefit from the info on the other pages as they address the most common problems and misconceptions associated with this endeavor. Basic answer to the question, "How do I freeze the wings?" Of course the short answer is . . .
How "iridescence" will affect your images. At least, the four that I use to get varying types of shots. For those of you who know all the other stuff, here are the photos . . .
A few ideas I have used, borrowed or stolen . . . If you are a beginner and just want to know what to do, start here. A detailed explanation of how I got one of my typical shots. Ghosting, causes and strategies to prevent it. For those who want to use flash. An occasionally updated collection of the best images I have created with my setups. Buy a Print! Click on the link above or below, or on the photo to the left. When the image appears, right click on it and choose "Set as Background."